Last Friday when I was in San Francisco, I visited my favorite garden store, Flora Grubb. They are known for their lush and abundant succulents and offer you every which way to create and grow your own succulent gardens that either hang on the wall or in beautiful containers around your living space. 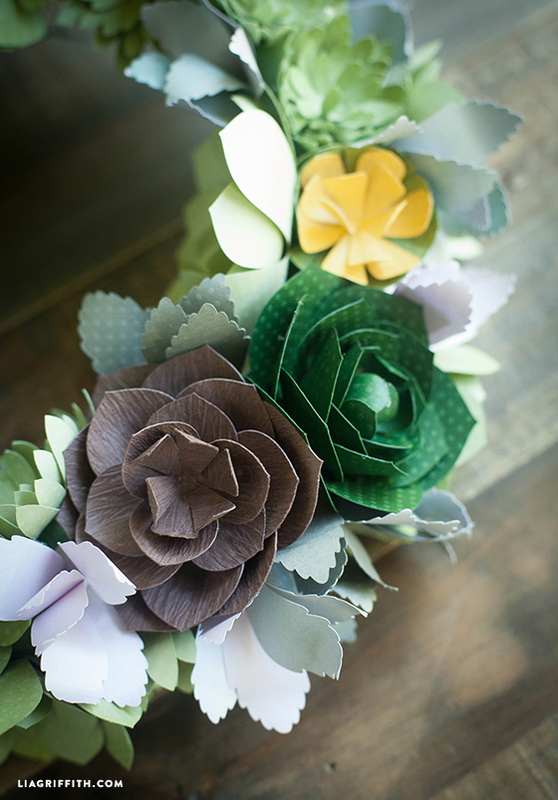 After going here, I was inspired to make the paper succulents that have been brewing in my creative brain for a while. So I decided to start with a simple paper succulent wreath. This is my new front door wreath, perfect for late summer and fall. I made my paper succulent wreath with polka dot cardstock and felted cardstock in different colors that I picked up at Michaels. 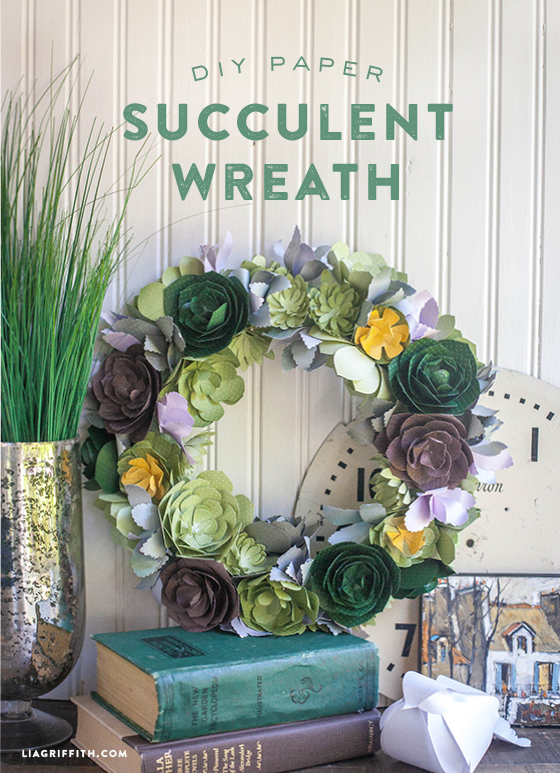 I designed four different succulent plants and mixing and matching the papers with the patterns made something that is just lovely out of paper and a green foam wreath. So simple! Check out my four succulent tutorials here as well as alternative ways to use these pretty succulents in small pots, wooden containers, or glass bowls. You have so many options when it comes to succulents! What will you do with yours? I finally finished my wreath. It was so much fun. How do I send you a picture of it? How nice! What kind of trouble do you have with the centers? One thing you may want to try if you haven’t already is to use text weight paper instead of cardstock as done in this original project (text weight is used here: https://liagriffith.com/diy-paper-succulents/, and here: https://liagriffith.com/jumbo-paper-succulents/). It’s easier to manipulate and move text weight paper! You can really use anything for this wreath! Our paper was from Micheal’s and is a mix or cardstock and text weight paper, so if you go that route I would say it would cost about $25-$30. Not sure. Micheal’s paper collection isn’t always consistent. You may have to just pick out whatever looks nice to you. I did use all cardstock. Can you please tell me what type of cardstock you are using to make this? I found it at Michaels. Exciting work you’ve done! 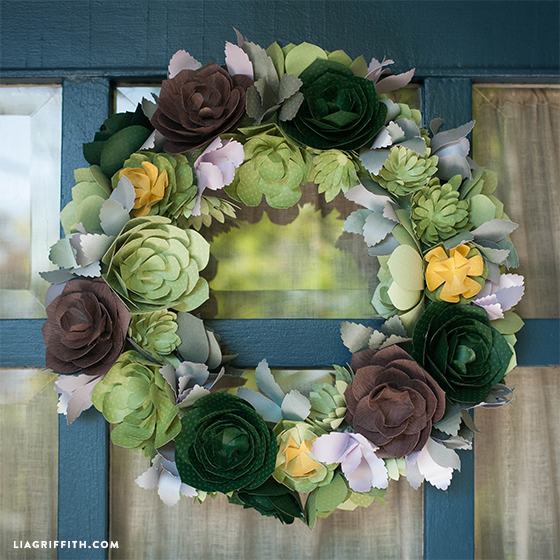 I’d like your diy wreath to be featured on my blog. Could you be so kind as to let me introduce you to Greek bloggers? I absolutely love this! Our company designs succulent wreaths and sells them on Etsy but this is such a great alternative!! AWESOME creation as usual! We are going to SFO in Oct. what are you fav things to do while there? The art museums! Last trip I went to Legion of Honor where they had the Impressionists. Not sure how long it is there. I have my set of shops I like to visit for inspiration (Castles in the Air in Berkley, Flax Art Supply, Flora Grubb of course). This trip I went to one of the Miette bakery/candy shops. Delightful! Hi. My name is Jennifer. 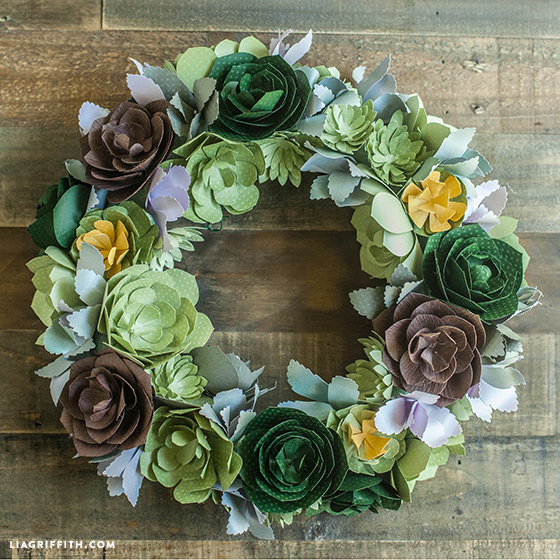 This wreath caught my eye while I was on Pinterest. First time at your site. How do I access directions or a tutorial for this? Is there a link someone can share? Thanks for your guidance. Hi Jennifer. As I mentioned in the post, the tute and pattern is to follow, and now they are live! Enjoy! I absolutely love this and can’t wait to see how each succulent is made. You are brilliant, Lia. Thanks Lynda! They are up now. I hardly can wait for the tutorial……thanks Lia!!! wooow this is lovely and beautiful , well done girl!!! I love it! U are great! Laura from New Zealand! Lia que puedo decir precioso,PUEDE DECIRME LAS REFERENCIAS DE LOS PAPERS Y FIELTRO? vIVO en Barcelona a lo mejor no lo encuentro igual pero tengo una amiga en California que puede comprarmelo. I can hardly wait to make this beautiful wreath. Lia your designs are so lovely. 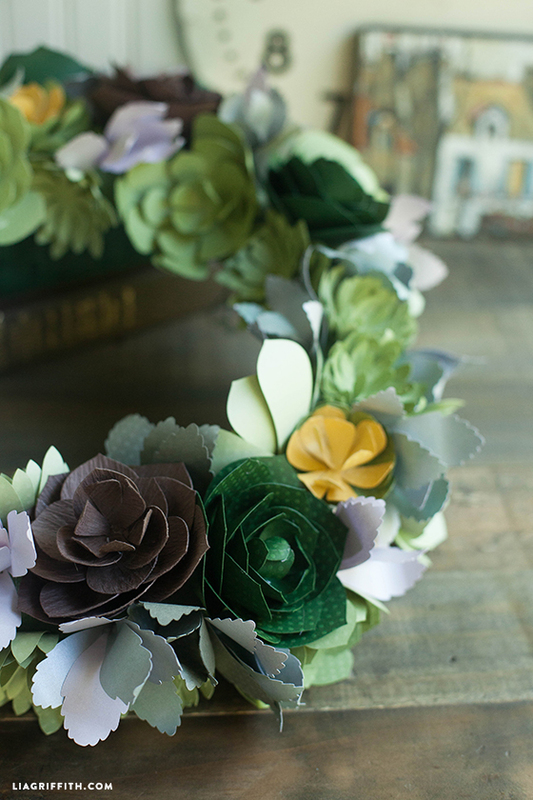 This wreath is absolutely exquisite! Is there anything your can’t make out of paper? Thanks Jane! I am not sure yet. I keep on surprising even myself. Haha. Oh my, I look forward every day to your posts. You create the most beautiful, unique pieces of art . It will be fascinating to see your tutorials for these pretty things. Everything you make is such gorgeous eye candy I am afraid to try to replicate your art. One day I hope to try one of your projects. bellissimo ! beatiful ! grazie! thank you! The felted card stock is amazing! I can’t wait for these tutorials! This is absolutely gorgeous, and so original. I can’t wait until you start the tutorial. I will do my best to follow along with you. ahhhhh!!!! I can’t wait til tomorrow! I feel like a kid waiting for Santa! What kind paper you using ? Card stock in different textures. Anything will work really. Stunning! Can’t wait to see how to make it! There are ways to convert any image for a cut file for most machines. Google your machine and see what is out there in tutorials. Gorgeous! I’m not fond of succulents, but this I love! Beautiful! Looking forward to your posting tomorrow. Thanks. Unique and just lovely. You are truly amazing! Thanks Sue! I am so gushing over succulents right now I just can’t stand it. Haha. So happy you like them. More arrangement coming too. I will see what I can do about the SVG. They are fun and easy! absolutely gorgeous!! can’t wait for the tutorials!! Thank you!! This is the best we have been pulling wedding decorations together and this is perfect – PERFECT!. Mint and Coral. I’m going to be waiting on pins and needles (I mean scissors and paper) for your next posts! You are the BEST! Thank you!